Yooka-Laylee is a spiritual successor to the classic Banjo-Kazooie. The Playtonic team are made up of veteran Rare employees who took to Kickstarter to fund the project. The crowdfunding campaign was incredibly successful, raising over £2 million – ten times the funding goal. 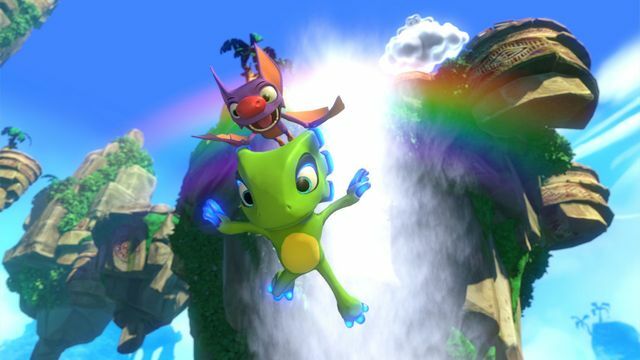 The game stars a green chameleon called Yooka and a purple bat called Laylee. The duo decide to go on an adventure to explore the mysterious Grand Tomes to stop the evil Capital B and Dr. Quack from stealing all the world’s books. Along the way there are plenty of wonderful characters for them to meet. Laylee spends most of her time sat on Yooka’s head and you control them together. If you’ve played any 3D platformer then the basic controls are familiar. Left-stick moves Yooka, while the Right-stick rotates the camera. Yooka can jump and a second press does a double-jump. Combat is a simple affair with a single button to mash to take out enemies. Holding Right-Trigger makes Yooka curl up into a ball. This lets him roll and can be used to move faster and climb ramps. There’s also a button to use Yooka’s tongue to collect butterflies to restore health and power. The action is mostly viewed from a third-person perspective but clicking the Right-stick in let’s you see from a first-person view. This is incredibly useful when looking around the huge environments. The third-person camera can be a little unwieldly and it does make movement tougher than it needs to be. The developers have already patched it since launch which has helped a lot and I presume will continue to tweak based on feedback. After a brief tutorial world called Shipwreck Creek, the game takes you to the hub world which is set in Capital B’s Hivory Towers business. It’s a complicated place that is hard to navigate and requires some effort just to find each of the five different worlds on offer. The worlds are accessed via Grand Tomes scattered around Hivory Towers. After opening the first one you need to find collectibles called Pagies to unlock the next. Collecting each Pagie requires you to complete some kind of challenge. Some of these can be obvious while others require more thought or exploration. Yooka-Laylee demands you explore as it sticks to the old school design of not really helping you at all. There’s no helpful interface to show you where to go next. There’s nothing to help explain how to solve a particular challenge which makes half the challenge working out what the challenge actually is. It’s all on the player to explore, learn and remember. I must admit my first few hours with Yooka-Laylee I felt overwhelmed and found it easy to get lost. Modern games tend to hold your hand and point you in the right direction all the time. Going back to this old kind of structure took some time to get used to. However the effort was well worth it and I really enjoyed the game once I properly got into it. The structure is definitely one that will put some players off. 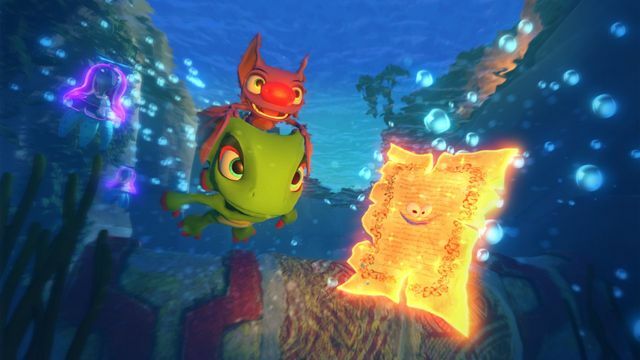 Yooka-Laylee is a big game, packed with ideas and things to do. Expect to easily spend upwards of 20 hours on your first playthrough. If you want to collect everything then you can add plenty more hours too. There are 145 Pagies to collect across the game. As well as unlocking worlds, Pagies can also be used to expand them. Doing so adds larger environments, more challenges and a boss battle. The boss battles are entertaining and rather difficult to beat. Even finding some of them can be tough. The other main collectible throughout the game are Quills. The levels are littered with them and each has 200 to find with a game total of 1,010. They serve two purposes, firstly they give you a hint of where to go. Secondly, you need to collect them to unlock abilities. Abilities are bought from Trowzer the snake who features in each world. You need to unlock the various abilities in order to beat the many challenges to get Pagies. For example in the first world you can buy three – a buddy slam, a sonar ability and another that lets you absorb plants. The buddy slam is used when in the air to slam Laylee into Yooka to make him hit the ground hard. The sonar ability can be used to activate hidden platforms. Finally you can buy an ability to eat plants to gain their properties for a short time. As an example eating the berries from a blue plant lets you spit water. On top of the main collectibles, Yooka-Laylee has plenty more as well. There are five ghost writers to find and beat in each world. Each requires different tactics to take down. Mollycools unlock transformations, Play Tonics add modifiers to the game and there are also health and power extenders. There’s also a Play Coin to collect that lets you access the retro games of Rextro Sixtyfourus. He has a collection of arcade minigames to play including a top-down kart racer, arena brawler, auto-runner and capture the flag. Most of these are only fun in very short bursts but you need to beat Rextro’s scores to unlock Pagies. The minigames can also be played outside of the main game both solo and with up to three other players. Graphically the game looks gorgeous with bright colourful visuals. The environments are huge and jam-packed with neat little touches. In more complex scenes the framerate does seem to dip on occasion but nothing that spoilt the game. The soundtrack is pretty great and has a proper nostalgic feel. However after a long play session it is very repetitive. One thing I really hated about the audio is that there is no voice-acting for the many fantastic characters you meet. Instead they all have their own annoying sound that plays instead of words and you can’t turn it off. At least you can hit a button to make conversations go quicker. Yooka-Laylee is a fun, nostalgic trip to the mascot platform games of the late nineties. It succeeds in recreating the experience but is also slightly let down by not adopting some of the elements seen in more modern games. While it looks like a kids game I feel it will be enjoyed most by gamers who grew up with the N64. 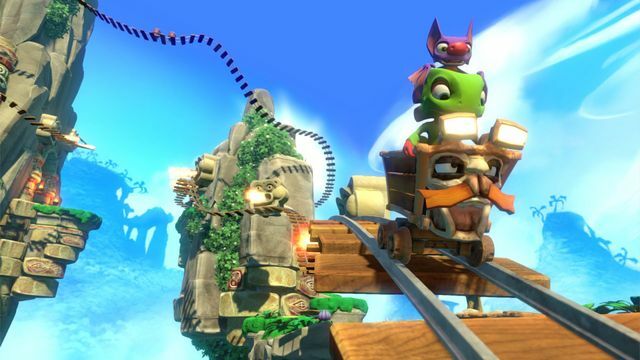 Yooka-Laylee was reviewed using an Xbox One digital code supplied by Team17.